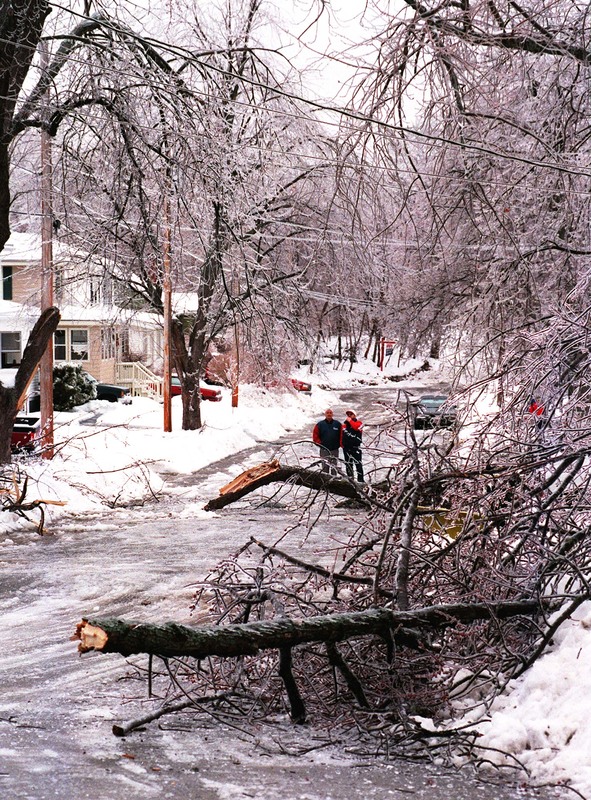 JAN. 8: A Farmingdale town official inspects ice damaged trees and power lines along Sheldon St..
JAN. 9: This view of Mountain Road shows why it was one of the worst hit in Falmouth and was closed to public travel for most of the two days of the ice storm. 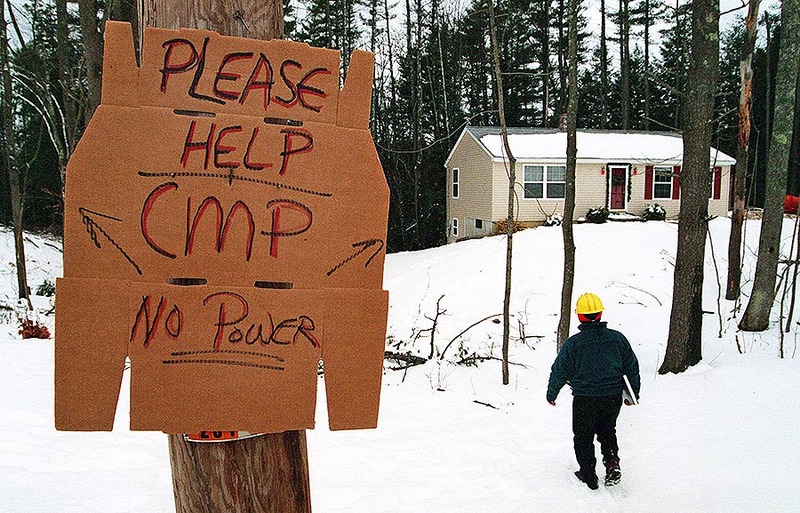 JAN. 11: A resident of Route 114 in Gorham put a sign out for the CMP crew on letting them know the family had no power. 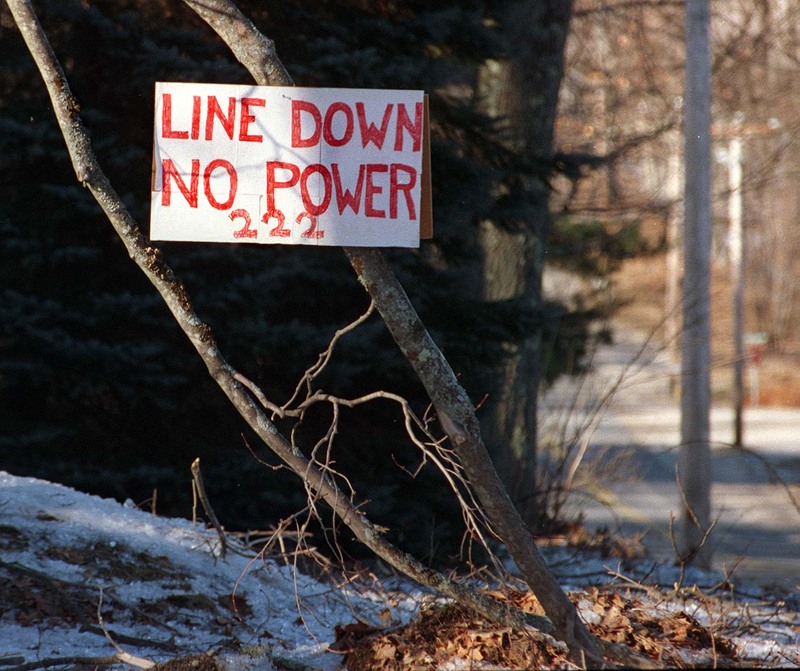 Signs like this helped crews determine who had not had their power restored at individual houses affected by the ice storm. 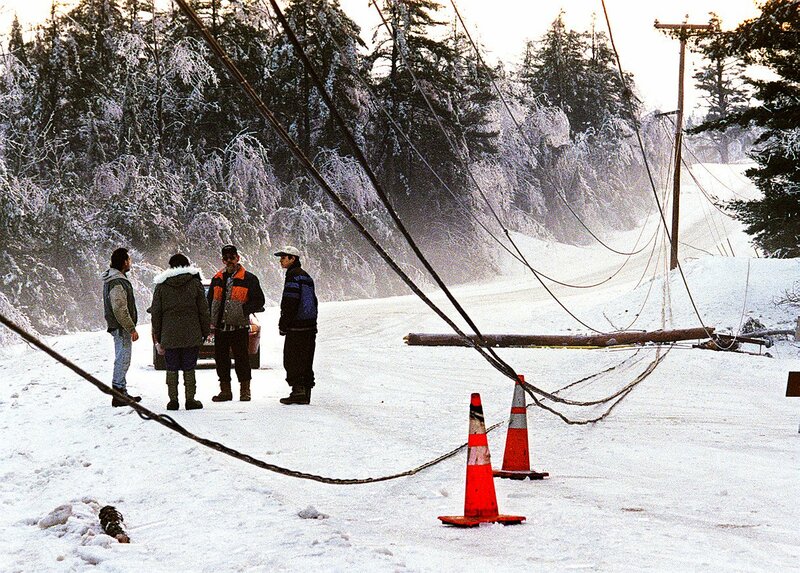 JAN. 25: Barry Rhoads, left, and Joel Kuntz, line workers from General Power Utility of Pennsylvania, repair lines in Cape Elizabeth. 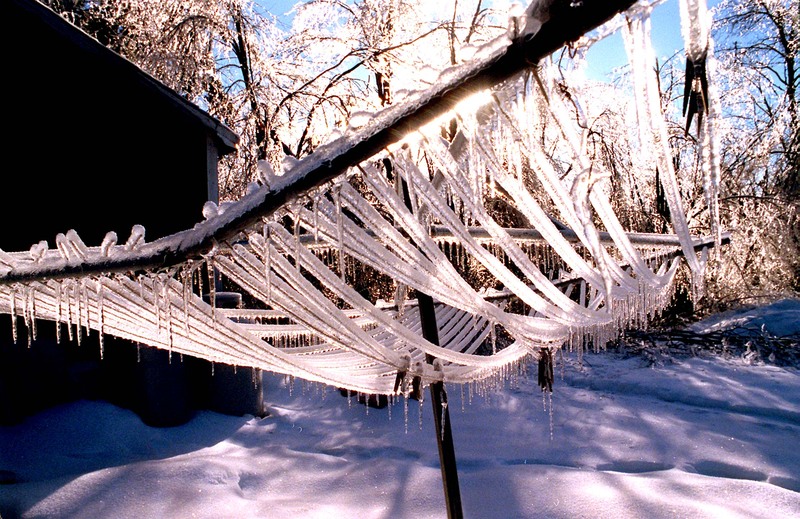 JAN. 12: Even the mundane became ethereal when coated in ice such as this clothes line photographed in Bridgton. 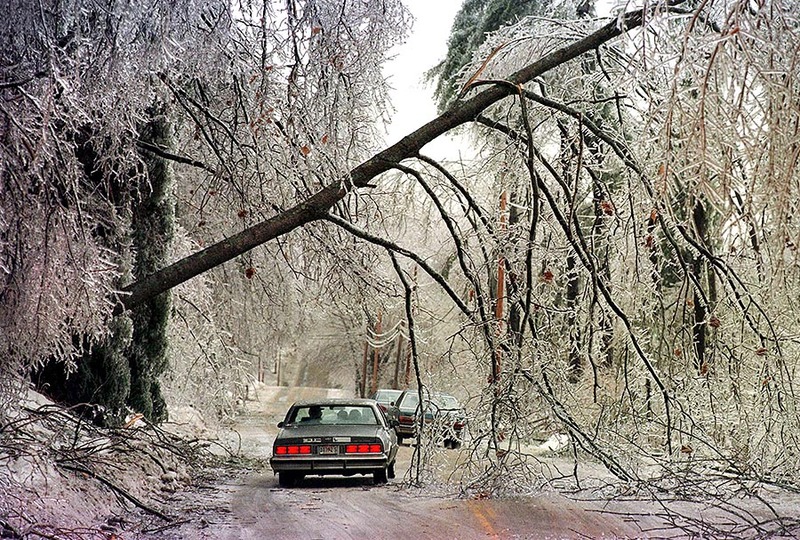 JAN. 9: Motorists had to take their chances driving under this tree that was resting on power lines on Route 5 in Limerick. JAN. 13: Andrew Phelps and Mike Allenwood, from Chase Excavating, clear some of the thousands of downed tree limbs from Mountain Road, Falmouth, where they had been working for two days. 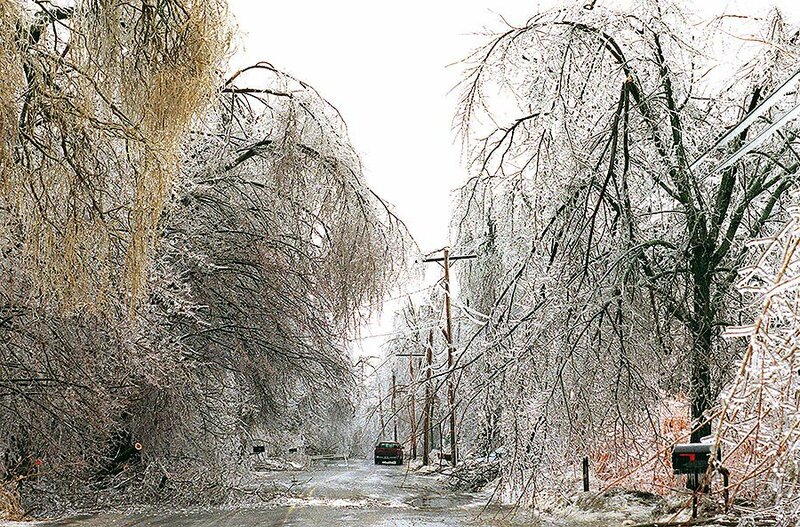 JAN. 9: Ice encrusted branches are cleared from power lines along South High Street in Bridgton as freezing rain and hail contributed to the load on the trees. 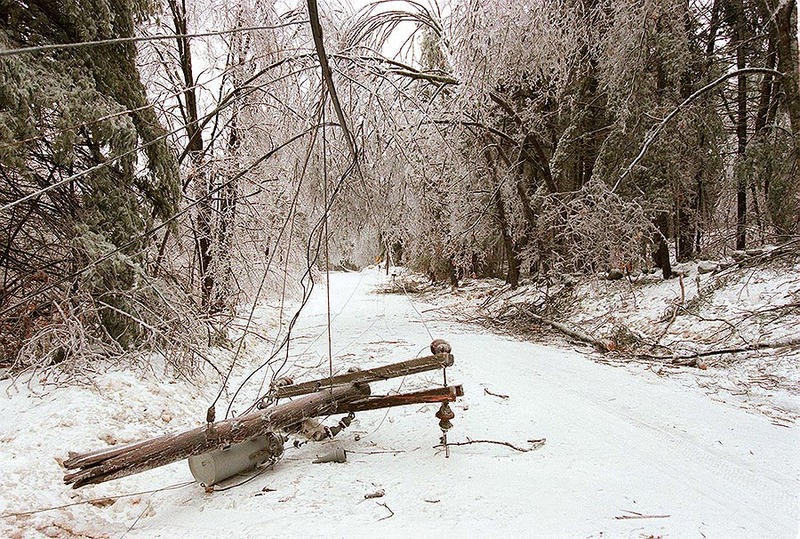 JAN. 9: Route 107 in South Bridgton, closed to traffic due to fallen trees and power lines, resembled a desolate country lane. 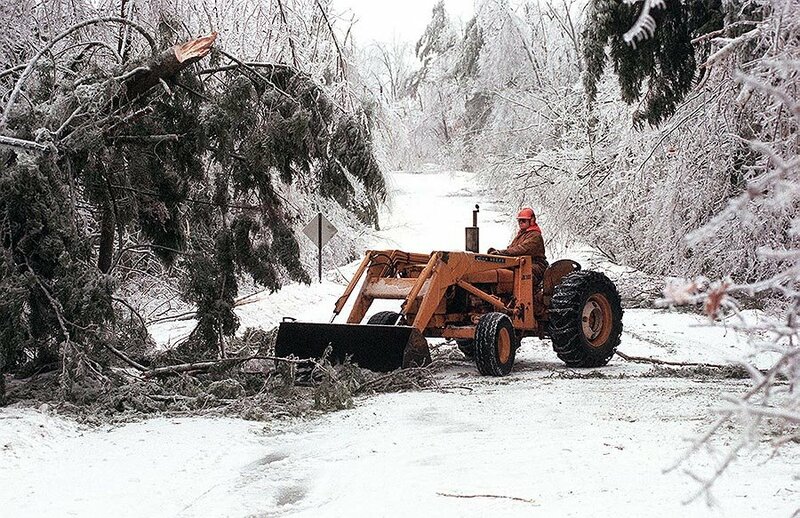 JAN. 9: Tom Gyger works with his tractor to clear a path down Route 107 as he spearheads a rescue effort. 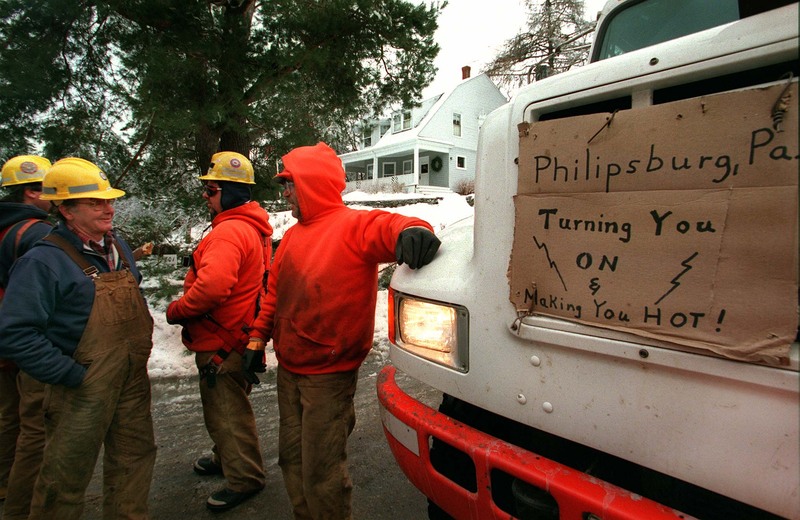 JAN. 25: Theo Miller, Tom Fitzpatrick, Jim Whitehead and Lew Kelligher, all line workers from General Public Utility Company of Pennsylvania, take a break from repairing power lines in Cape Elizabeth. 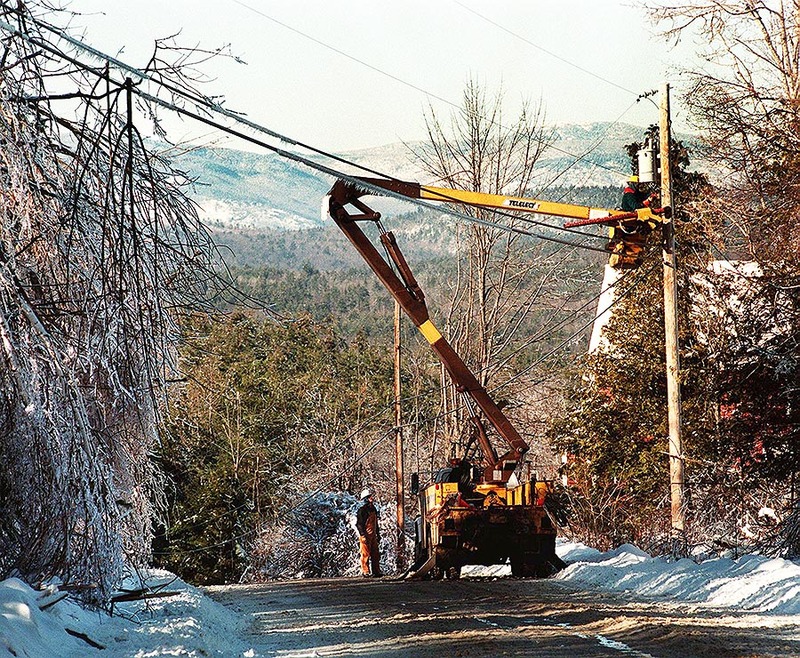 JAN. 10: A crew from Bell Atlantic replaces a telephone pole alongside Route 302 in Windham as the warming sun starts to melt the ice. 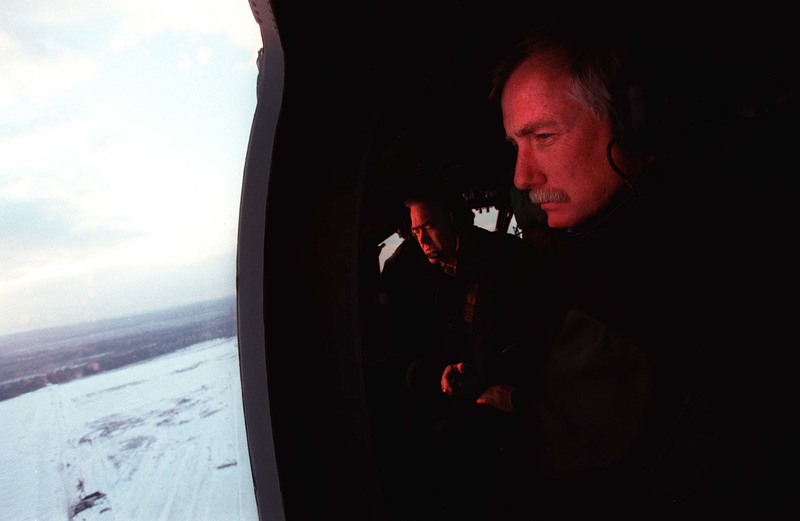 JAN. 11: Governor Angus King inspects a 10-mile stretch of downed power lines in Washington County from an Air National Guard helicopter. 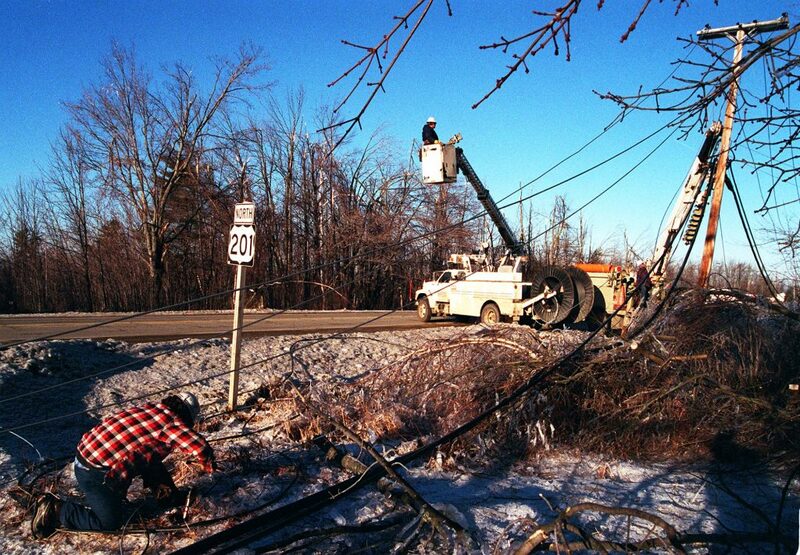 JAN. 11: Linemen from Bell Atlantic work to replace a line of 12 poles knocked down alongside Route 201 in Gardiner. 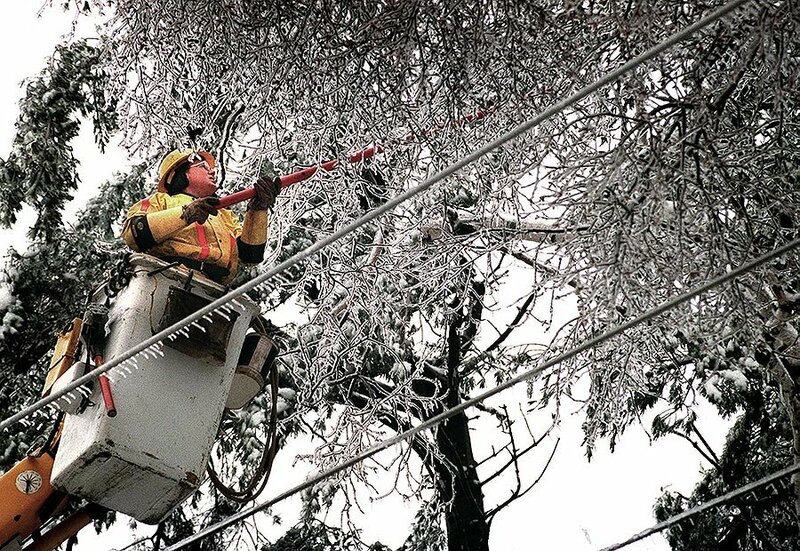 JAN. 13: Towns like Limerick, in western York County, showed the effects of the ice storm days later, but the efforts of clean-up crews were also evident. 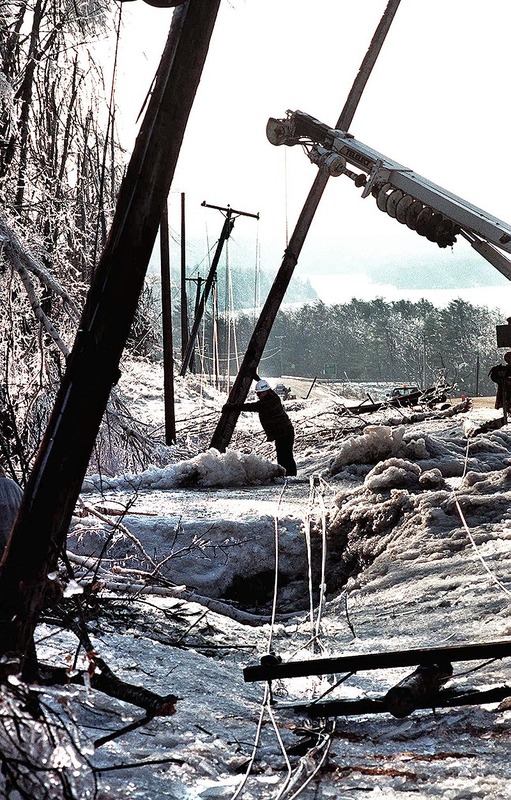 JAN. 17: A line crew from Halpin Line Construction in Hingham, Massachusetts, works alongside ice-encrusted Route 93 in Sweden. 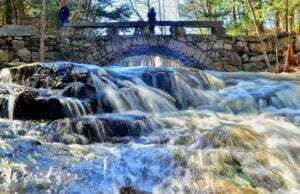 The crew spent four days in Vermont before arriving in Maine. 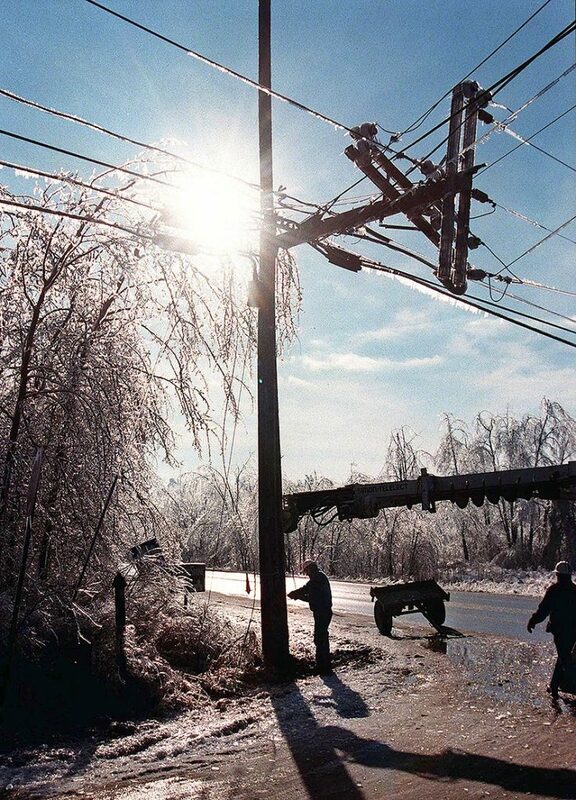 JAN. 20: Dennis Marrotte, a substations general technician from CMP, walks towards a house on Route 302 in Westbrook to do a storm assessment before repairs are made to broken power lines. 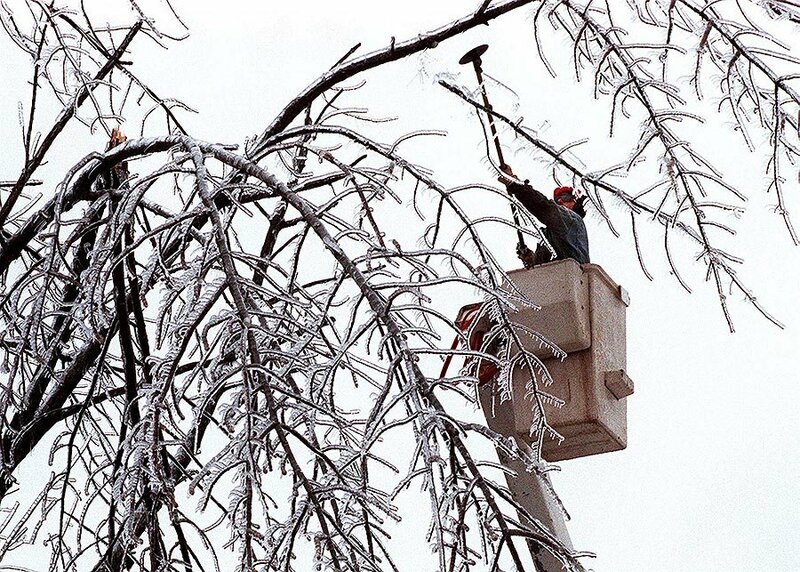 JAN. 24: Central Maine Power lineman Tim Weeks trims ice-coated branches along power lines on Shore Road in Cape Elizabeth. 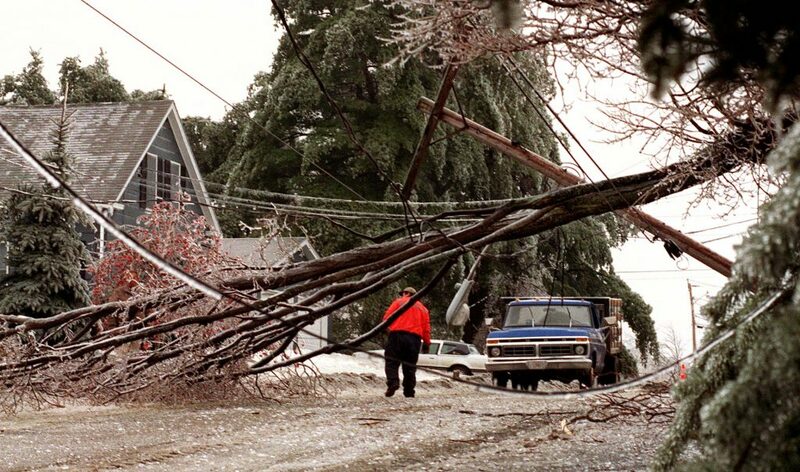 Weeks, based out of Portland, was coming off his first 10-hour downtime since the first ice storm hit. FEB. 6: Kassandra Haines, a first-grader at Bethel's Crescent Park School, had lasting memories of the great ice storm of 1998. 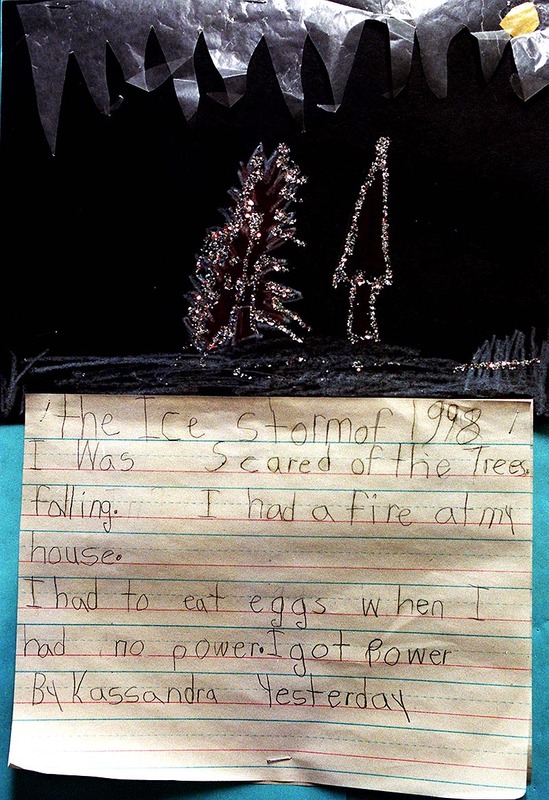 The students there were given projects to share their feelings about the storm. 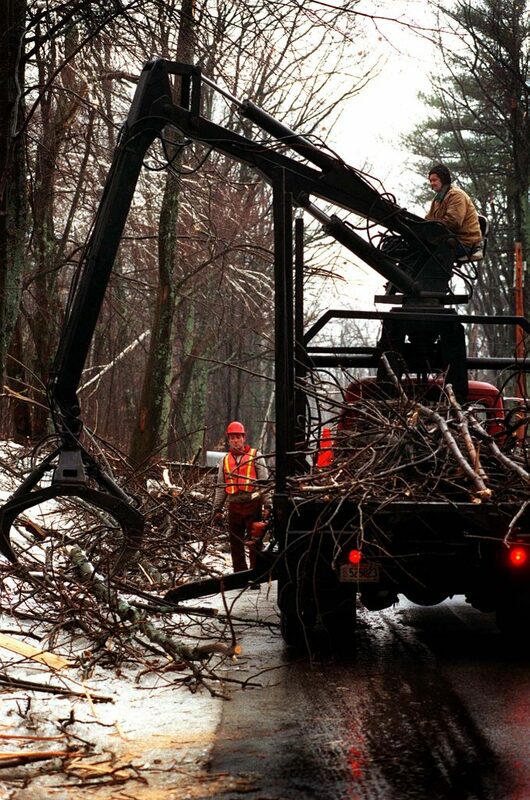 JAN. 9: Tom Gyger of South Bridgton uses his own tractor to clear a path down Route 107. 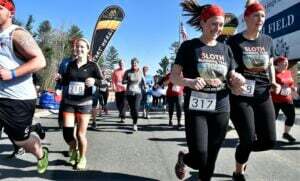 Geyger was laboring with three other South Bridgton residents to clear a path down the closed section of Route 107 to rescue Mac Gillet from his remote home at Moose Cove. 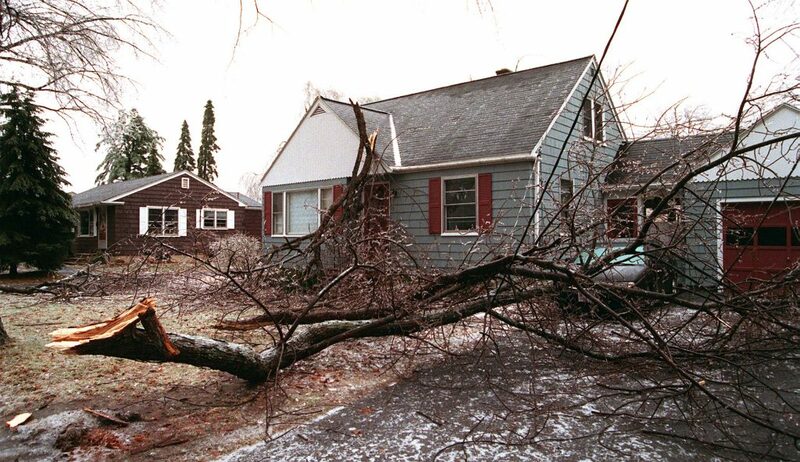 JAN. 9: Ice covered branches fell on power lines and on the front roof of 93 Warwick St., Portland. JAN. 12: Marc LeClair fills up bottles with water at the Ricker Middle School, Litchfield for use in his home which has been without power and water for days due to the ice storm. 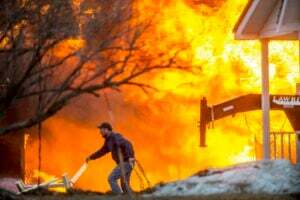 JAN. 9: : It took four men armed with three chain saws, a tractor and a snowplow to rescue Mac Gillet from his remote South Bridgton home. 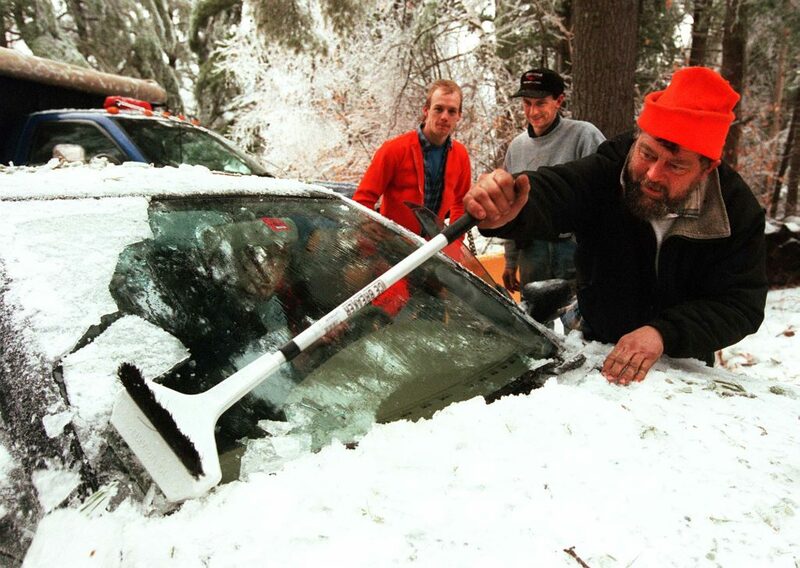 Paul Field, Sr. scrapes the window of Gillet's car as Eric Whitehouse and Paul Field, Jr. wait to lead the way out after clearing a path down closed Route 107 to Gillet's home at Moose Cove. 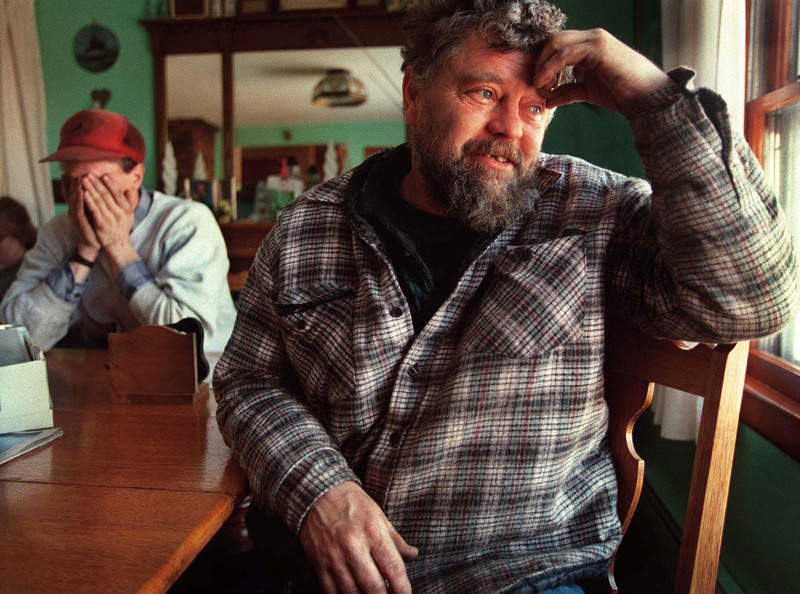 On Jan. 14, Paul Field (right) and his son, Paul Jr. show some of the exhaustion that they experienced since the ice storm started last week. 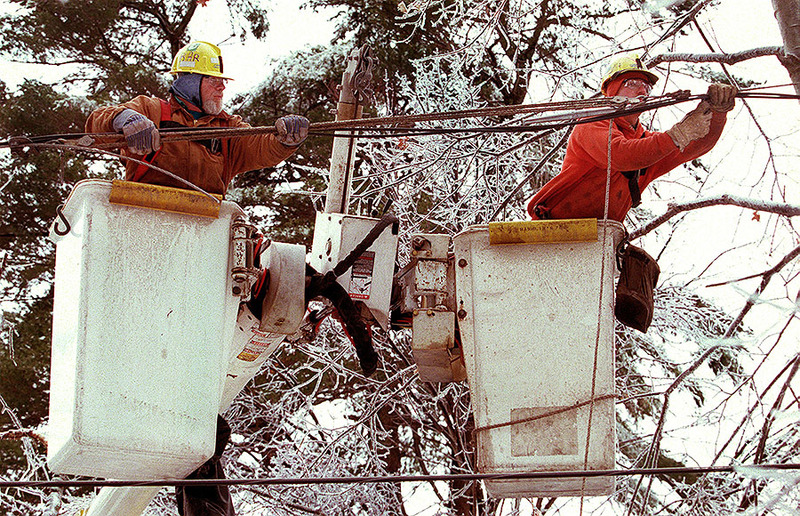 JAN. 25: Barry Rhoads (left) and Joel Kuntz, line workers from General Power Utility of Pennsylvania, repair powerlines in Cape Elizabeth. 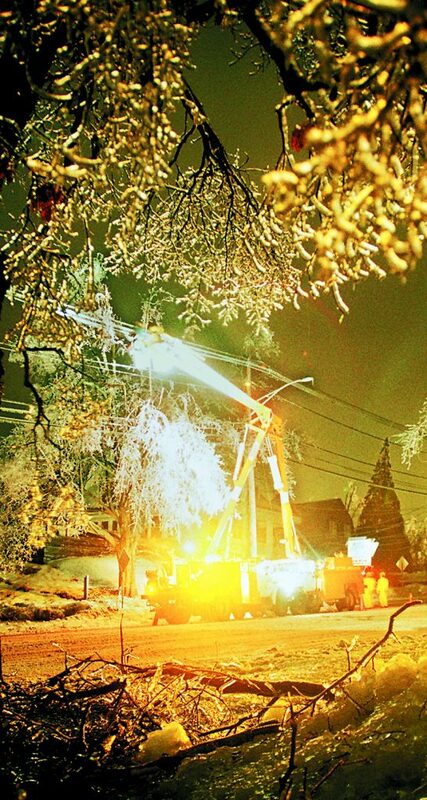 JAN. 24: Broadway in South Portland is closed to traffic as once again ice caused as power lines to snap. JAN. 12: A crew from Bell Atlantic works to straighten one of the few remaining utility poles along a stretch of Route 201, in Gardiner. 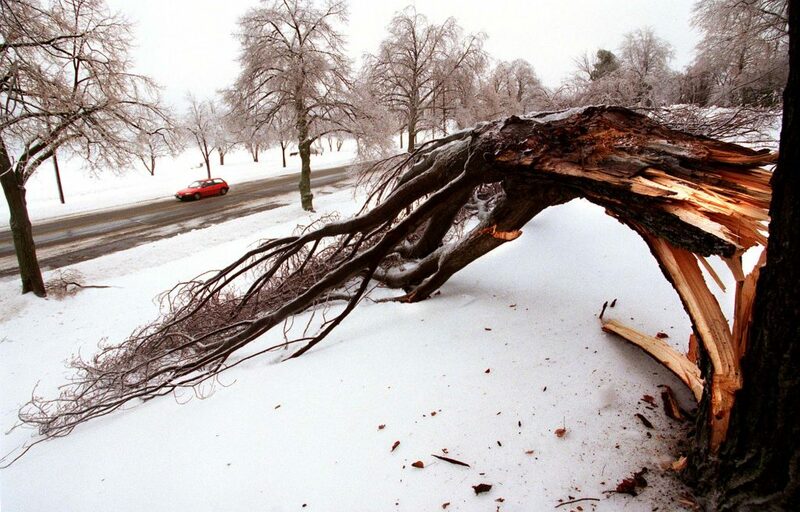 JAN. 24: A large section of a tree was downed by its ice-laden branches along Baxter Boulevard in Portland. 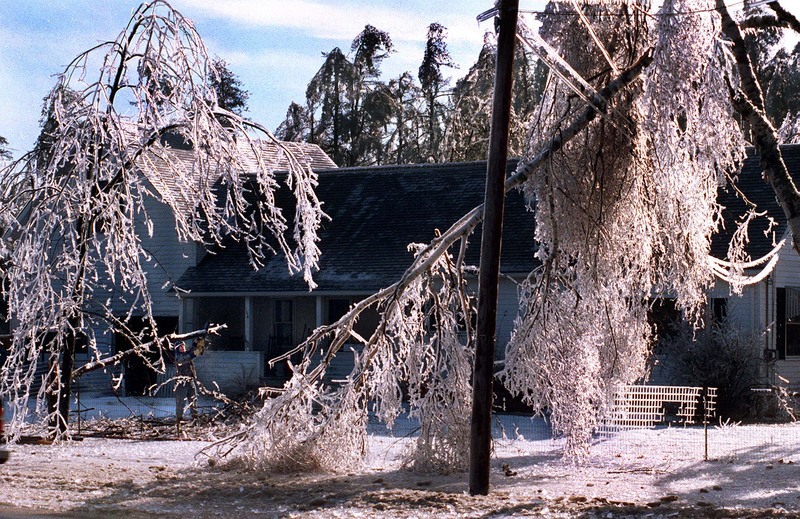 JAN. 10: Jewel McHale cuts up one of the many trees that broke under the weight of the ice at her house on Yarmouth Rd. in Gray. 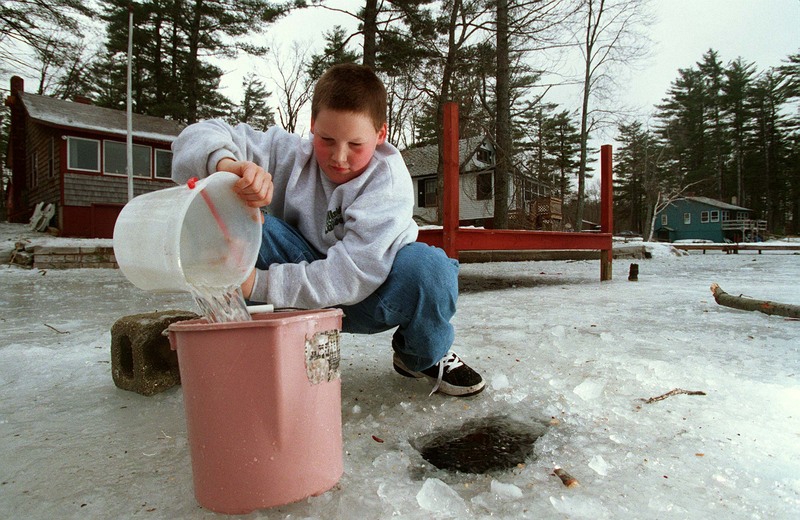 JAN. 15: Toby Winkler, 13, gets water from a hole in the ice of Pettingill Pond. 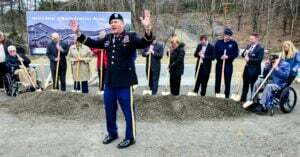 Winkler takes the water back to his home on Angler Road in North Windham to use when flushing the families toilet. 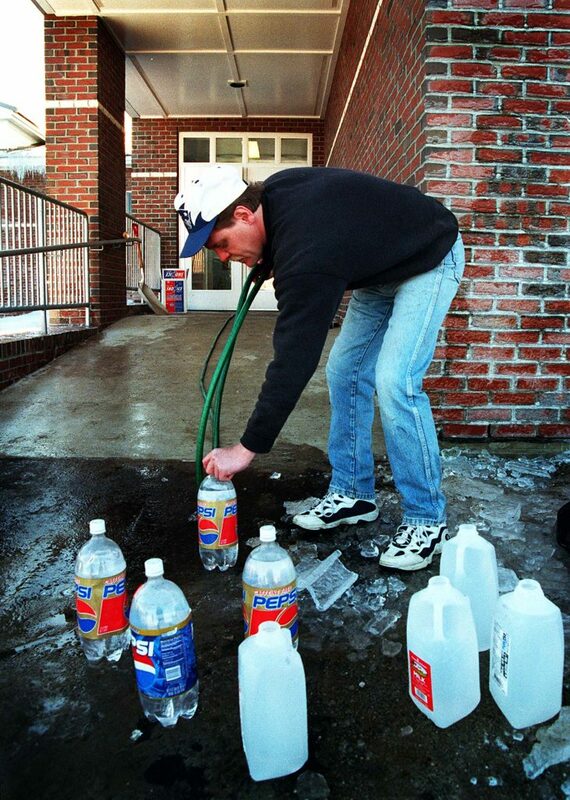 JAN. 9: Bill Grober of Stow fills jugs with kerosene as a line forms at the Foster-Russell Company in Bridgton. 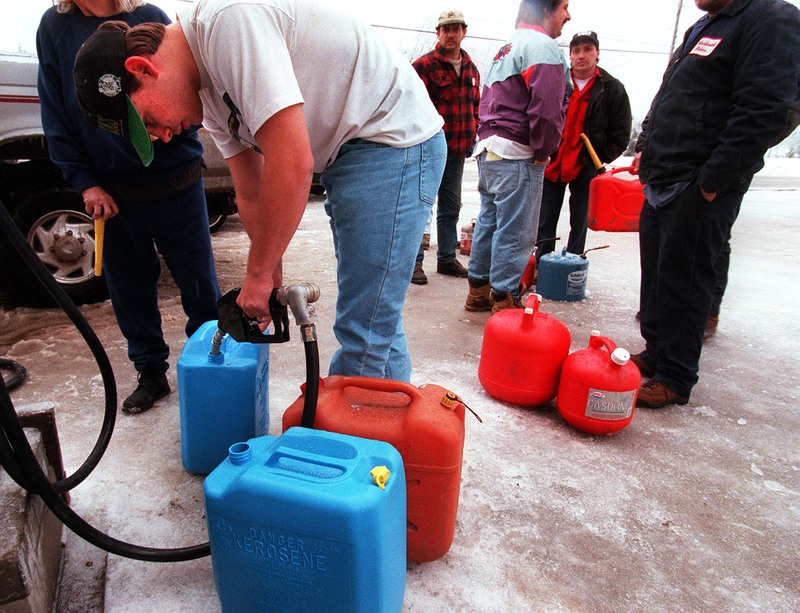 The kerosene was pumping thanks to a portable generator which powered the electric fuel pumps. 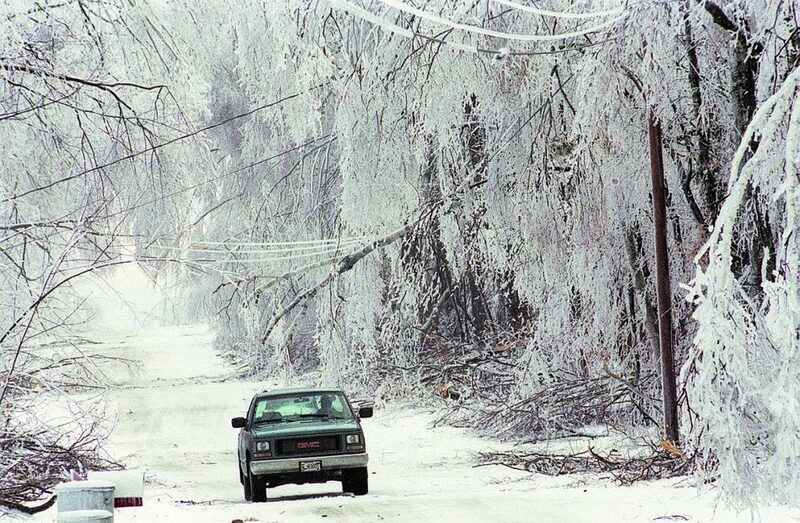 JAN. 11: A state game warden drives through the ice covered trees along the Files Road in Thorndike. 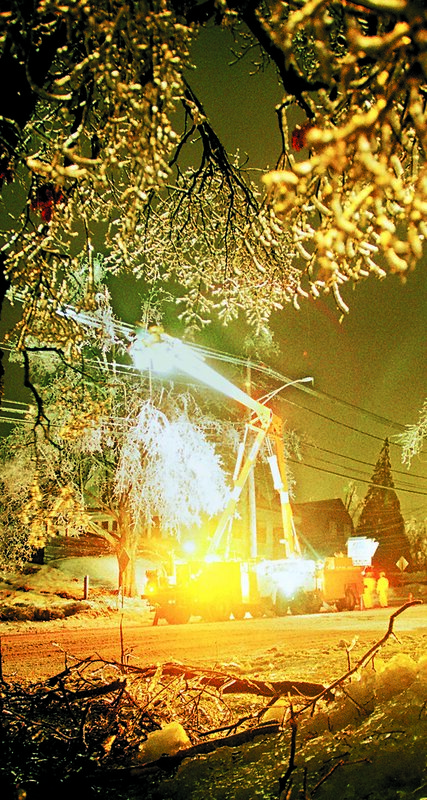 JAN. 9: The yellow flashers of Central Maine Power trucks light up Western Avenue in Augusta around 4 a.m.
JAN. 11: Bystanders look over a section of the Albion Road closed to traffic due to broken poles and wires.  JAN. 16: Many people throughout Washington County lost the meat stored in their deep freezers after the power went out. 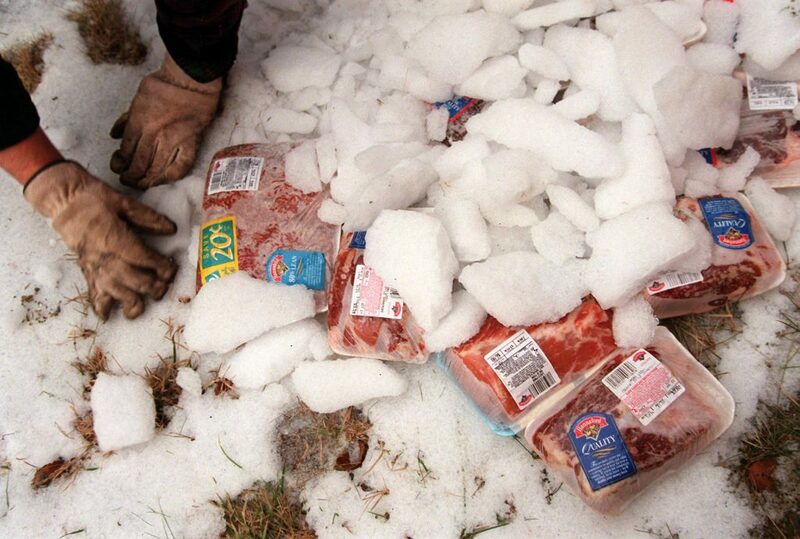 Adam Thompson of Cape Split in South Addison resorted to storing his meat outside under chunks of ice, which was in plentiful supply. 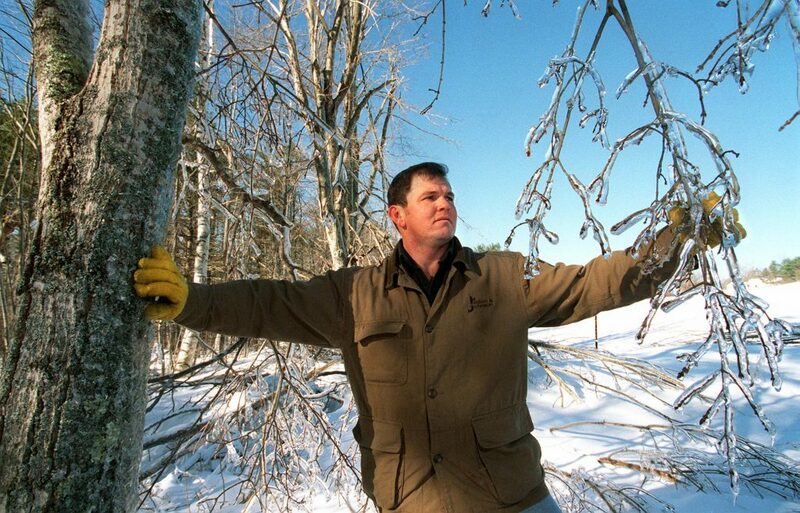 JAN. 17: Bill Symonds stands beside some of his best maple trees which were decimated by the ice storm. The trees were some of the best producers of sap for his Casco maple sugaring business. 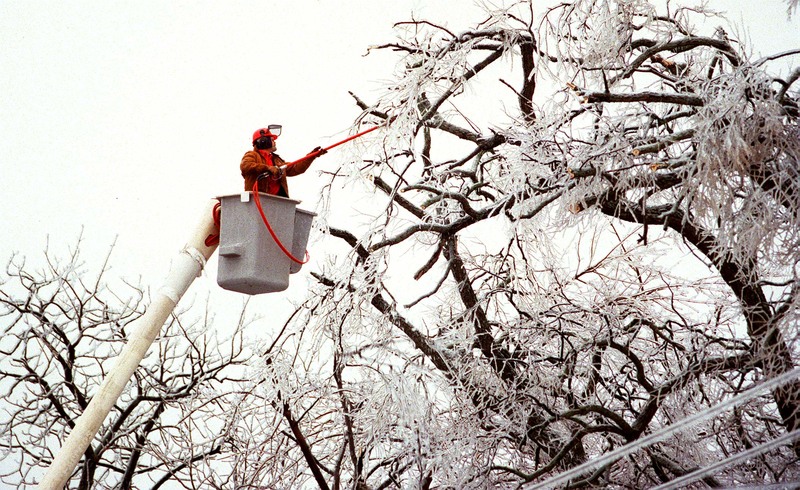 JAN. 24: A tree crew member trims ice-coated branches from trees overhanging power lines along Broadway in South Portland. 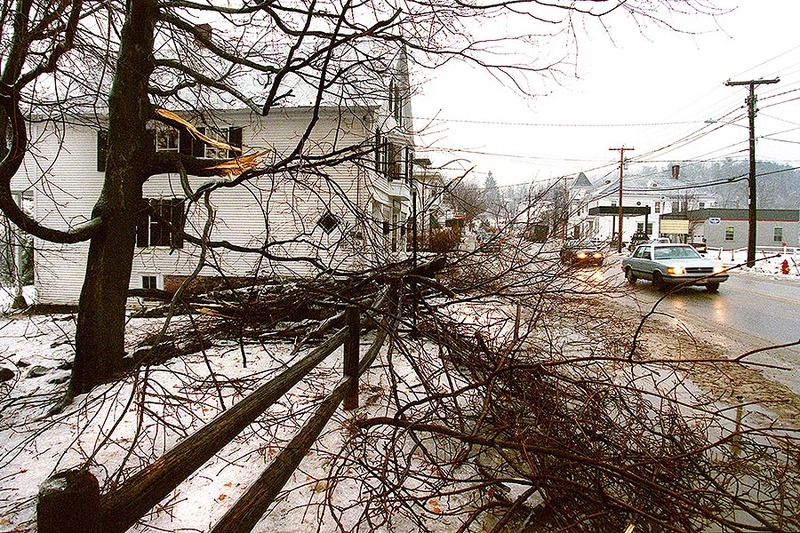 JAN. 24: South Portland residents assess the damage to fallen power lines and tree limbs on Bowers Street.